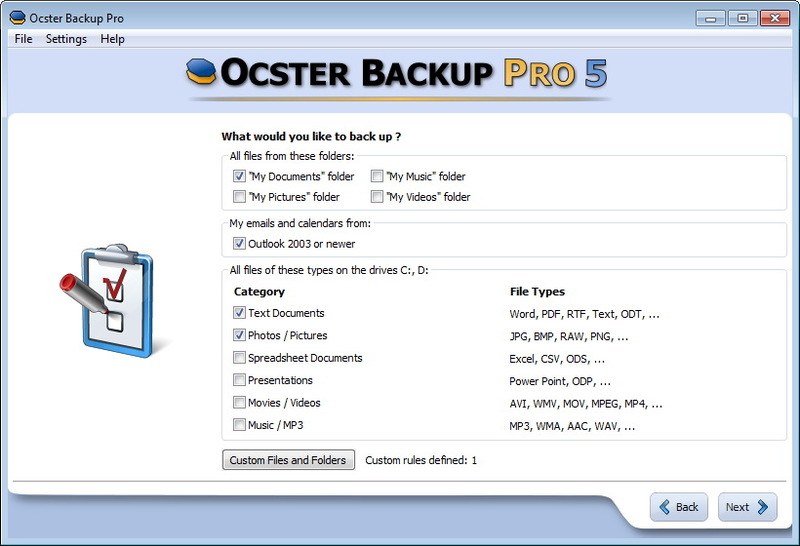 Ocster Backup Pro 5 is easy to use, versioning, automatic pausing one of the best backup tools on the market. 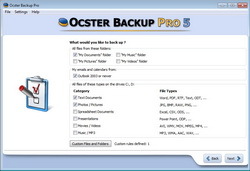 Ocster Backup Pro 5 was available as a giveaway on November 29, 2010! How would you improve Ocster Backup Pro 5? On the other hand, it was nice to get an update under the GAOTD license. It seems odd that a 'Pro' version of a program seems to push its (overpriced) add-on: online backup. This version seems to be aimed at the complete novice. See feedback for more... On the other hand, it was nice to get an update under the GAOTD license. I see no mention of Ocster backing up the OS; ie, if my Vista crashes due to a hardware issue can Ocster restore the OS & all my GAOTD files (which we all know to be NOT re-installable due to the 24 hour restriction) to a new machine? My guess is that it can't. I see no mention of Ocster backing up the OS; ie, if my Vista crashes due to a hardware issue can Ocster restore the OS &amp; all my GAOTD files (which we all know to be NOT re-installable due to the 24 hour restriction) to a new machine? My guess is that it can't. i would like to see a proprietary format with the key to restore itself. the reason that proprietary formats are good is you can achieve compressions that you dont see elsewhere, and if the reason you need to restore is a virus, the backed up files are untouched. but if you must so this, the program needs to back a copy of itself up in the files in standard format so you can reinstall from your file destination. bout the only reason i would want propiatary, but there has to be other ways to keep it safe from viruses that doesnt limit you so much. i would like to see a proprietary format with the key to restore itself. the reason that proprietary formats are good is you can achieve compressions that you dont see elsewhere, and if the reason you need to restore is a virus, the backed up files are untouched. but if you must so this, the program needs to back a copy of itself up in the files in standard format so you can reinstall from your file destination. bout the only reason i would want propiatary, but there has to be other ways to keep it safe from viruses that doesnt limit you so much. In my industry, compliance requires that backups are kept for 6 years. Having already seen the debacle with Tape drives and their useless software it is obvious that relying upon a proprietary format is suicidal. My strong suggestion for Ocster 5.1 is that they provide the option of generating a Zip file. @#25 In my industry, compliance requires that backups are kept for 6 years. Having already seen the debacle with Tape drives and their useless software it is obvious that relying upon a proprietary format is suicidal. @Ocster developers: My strong suggestion for Ocster 5.1 is that they provide the option of generating a Zip file. Leslie. #5: "This appears to be a handy tool but it’s very slow. My back-up plan was only 6GBs and after one hour I still have an estimated 31 hours left..."
ALL file backup apps are slower than creating a disk/partition image backup, if for no other reason that Windows has to deal with each file rather than a mass of 1s & 0s. Ocster Backup was/is likely worse, as it's designed to be unobtrusive to the extreme, going about it's biz quietly so you just keep working. That makes it maybe impractical backing up several gigs worth, but ideal for backing up say the average person's emails a few times a day. #13: "... has not anyone simply considered downloading and installing the software on a remote device; (Flash Drive) for instance?..." That said, installing Ocster Backup didn't require a restart. If you got into a bind, it should install OK (as a trial) after booting to a WinPE type boot disc &/or USB stick -- they run from RAM disks they create on booting, & when you shut them down, everything including that install goes away. So if you needed files from a backup archive, but didn't want to install the trial on a PC/laptop you didn't own, that may be a way out, booting from a CD, installing Ocster Backup, & saving the files to the host PC's drive or a USB stick or wherever. They've got several projects over at boot-land.net where, using your Windows install disc or disc image you can have an ISO file to burn to CD in ~10 minutes -- putting it on a USB stick will take a little longer & be slightly more involved -- in a couple of hours you can try several CDs to see which one you like & what works best. #17: "... Uses a proprietary format for the backed up data. That’s all I need to know to skip this. There are numerous backup programs available that create standard zip archives." #19: "... can’t imagine why anyone would want to use a programme that backs up to a proprietary format. I would hate to be at the mercy of some software manufacturer..."
#20: "What sense does it make to backup your machine with proprietary software that you’ll have to purchase when you want to restore your machine due to a crash?" A file backup, regardless what app created it, will not restore your system if the hard drive fries, or mal-ware trashes Windows etc. -- there's some special formatting that restoring files can't do, & if it did, it'd take far too long [a disk/partition image backup is way more efficient, but a bit of a hassle to get individual files out of a backup archive]. So in a case where Windows was either beyond repair, or it would take too long, you'd restore the most recent image backup, then as necessary restore any individual files that were newer, using the copy of Ocster Backup Pro that was restored along with that disk/partition image. RE: Std. zip format versus Ocster's, when you're *just* extracting files from a backup archive & don't have the original backup app that created that archive installed, then plain, std zip is an advantage. If you want to restore a full or partial backup to its original location, IMHO the benefits of using the original, creating app outweigh doing it manually, so however it stored the files is more or less irrelevant. I store stuff like important sales receipts in .zip or .7z because I don't care about folder structure & I may need them years from now. But when it comes to emails stored in an archive for 3 or 30 days, odds are really high I'd still have Ocster Backup installed. #5: <em>"This appears to be a handy tool but it’s very slow. My back-up plan was only 6GBs and after one hour I still have an estimated 31 hours left..."</em> ALL file backup apps are slower than creating a disk/partition image backup, if for no other reason that Windows has to deal with each file rather than a mass of 1s &amp; 0s. Ocster Backup was/is likely worse, as it's designed to be unobtrusive to the extreme, going about it's biz quietly so you just keep working. That makes it maybe impractical backing up several gigs worth, but ideal for backing up say the average person's emails a few times a day. * * * #13: <em>"... has not anyone simply considered downloading and installing the software on a remote device; (Flash Drive) for instance?... "</em> Unfortunately I don't think it'd work that way with Ocster Backup Pro. Installing it to your hard drive or USB stick takes care of the program's folder, but not the stuff that's added elsewhere &amp; to the registry. It *might* work as a trial if the host PC has the required C/C++ runtimes installed from Microsoft, but I don't know that you could really depend on it working perfectly. There's certainly nothing wrong with using a USB stick to install to, but I'd hate to think of someone getting into a bind because half-way through a restore the app crashed or something. :-( That said, installing Ocster Backup didn't require a restart. If you got into a bind, it should install OK (as a trial) after booting to a WinPE type boot disc &amp;/or USB stick -- they run from RAM disks they create on booting, &amp; when you shut them down, everything including that install goes away. So if you needed files from a backup archive, but didn't want to install the trial on a PC/laptop you didn't own, that may be a way out, booting from a CD, installing Ocster Backup, &amp; saving the files to the host PC's drive or a USB stick or wherever. They've got several projects over at boot-land.net where, using your Windows install disc or disc image you can have an ISO file to burn to CD in ~10 minutes -- putting it on a USB stick will take a little longer &amp; be slightly more involved -- in a couple of hours you can try several CDs to see which one you like &amp; what works best. * * * #17: <em>"... Uses a proprietary format for the backed up data. That’s all I need to know to skip this. There are numerous backup programs available that create standard zip archives. "</em> #19: <em>"... can’t imagine why anyone would want to use a programme that backs up to a proprietary format. I would hate to be at the mercy of some software manufacturer..."</em> #20: <em>"What sense does it make to backup your machine with proprietary software that you’ll have to purchase when you want to restore your machine due to a crash? "</em> A file backup, regardless what app created it, will not restore your system if the hard drive fries, or mal-ware trashes Windows etc. -- there's some special formatting that restoring files can't do, &amp; if it did, it'd take far too long <em>[a disk/partition image backup is way more efficient, but a bit of a hassle to get individual files out of a backup archive]</em>. So in a case where Windows was either beyond repair, or it would take too long, you'd restore the most recent image backup, then as necessary restore any individual files that were newer, using the copy of Ocster Backup Pro that was restored along with that disk/partition image. RE: Std. zip format versus Ocster's, when you're *just* extracting files from a backup archive &amp; don't have the original backup app that created that archive installed, then plain, std zip is an advantage. If you want to restore a full or partial backup to its original location, IMHO the benefits of using the original, creating app outweigh doing it manually, so however it stored the files is more or less irrelevant. I store stuff like important sales receipts in .zip or .7z because I don't care about folder structure &amp; I may need them years from now. But when it comes to emails stored in an archive for 3 or 30 days, odds are really high I'd still have Ocster Backup installed. I am reading a few of the comments here on "GAOTD", and for the life of me I can not understand the issues with "PROPRIETARY SOFTWARE"; listen, if you have a crash or something of the sort and you have to retrieve the software, save a copy to a remote device; similar to a "flash drive". When you go to your program files, simply <send to/copy to a remote device. Everything in the folder, all essential files and dll's are automatically transferred. I do it all the time. Save a copy of course, of all your registration codes; etc. Keep all of your changes/modifications updated and syncronized between the hard drive and flash drive. You can do that automatically or manually..........you do not have to purchase the software again; just download the software, install it and insert your original registration code. Once you have all installed on the device, test it; it functions fine! If you want, then you can delete it from the host computer if you don't need it. You will have the same success backing up your files.............simple enough? I am reading a few of the comments here on "GAOTD", and for the life of me I can not understand the issues with "PROPRIETARY SOFTWARE"; listen, if you have a crash or something of the sort and you have to retrieve the software, save a copy to a remote device; similar to a "flash drive". When you go to your program files, simply &lt;send to/copy to a remote device. Everything in the folder, all essential files and dll&#039;s are automatically transferred. I do it all the time. Save a copy of course, of all your registration codes; etc. Keep all of your changes/modifications updated and syncronized between the hard drive and flash drive. You can do that automatically or manually..........you do not have to purchase the software again; just download the software, install it and insert your original registration code. Once you have all installed on the device, test it; it functions fine! If you want, then you can delete it from the host computer if you don't need it. You will have the same success backing up your files.............simple enough? According to the Ocster site linked up top, Ocster Backup Pro 5 has added Versioning [select which version of a file to restore] & internal improvements compared to the earlier GOTD, version 4 Pro in August [a biz version was on GOTD in October]. The program otherwise works the same, with you creating backup *Plans*, listing what files/folders to include, what file types to exclude, & having them run on a schedule &/or manually. Everything's set up with an easy wizard interface, & you're given a fair amount of control over stuff like how your backup archives are compressed, if at all, & the same for encryption. You do need Ocster Backup to restore any files, which probably isn't that big a deal for most home users -- you wouldn't use it for really long term archives [I hope they're still around, but 5 - 10 years from now?...] & it's not intended to replace the full disk/partition image backups you should be doing anyway [which presumably would include your Ocster Pro install]. And for extra insurance there's always the trial -- it might not hurt to download & save a copy as part of your whole backup in case of disaster plan. As file backup apps go Ocster does a good job, & it's very easy to set up plans including the usual My Documents, My Pictures etc. folders -- you might want to set up more than one plan because Ocster won't backup when it detects changes, nor will one plan run more than once a day [unless you tell it to manually]... that's not a huge negative though, since while you may decide to back up your e-mails hourly for example, whatever you have in other folders may only need backed up once a day (or less), & backup archives do take up space. Again because it doesn't replace a disk/partition image backup, there's no need to include things like software or Windows files, nor is there a need to have a boot disc or any of that -- it just makes it as fast & easy as possible to get individual files/folders restored. Ocster Backup Pro does make an impact on your system during installation, which may include C/C++ runtime installs from Microsoft, along with Windows updates for or to those runtimes. Installing Ocster Backup also mirrors your User files/folders, which can mean an awful lot of new files & folders taking up a fair amount of disk space. Additionally you've got 2 folders added under All Users, + 1 more under your UserName, a Microsoft folder under Common Files, & the program's folder itself [~20 MB in 190 files, 2 folders]. Registry adds can go north of 3k. IMHO the choice of how to backup new &/or changing files depends on how valuable those files are to you, what security's needed, what hardware &/or devices you use, & how much time & effort you want to put into it all. If most all your docs, images, e-mails, & tunes for example are stored on-line [i.e. in the much-hyped cloud], you might have zero need. Likewise you may keep everything synced on-line for access with your cell, so the copy on your hard drive is just that, a copy. OTOH some e-mail &/or docs may be too sensitive to let go of -- that's where something like Ocster backup, or data/drive mirroring come in. According to the Ocster site linked up top, Ocster Backup Pro 5 has added Versioning <em>[select which version of a file to restore]</em> &amp; internal improvements compared to the earlier GOTD, version 4 Pro in August <em>[a biz version was on GOTD in October]</em>. The program otherwise works the same, with you creating backup *Plans*, listing what files/folders to include, what file types to exclude, &amp; having them run on a schedule &amp;/or manually. Everything's set up with an easy wizard interface, &amp; you're given a fair amount of control over stuff like how your backup archives are compressed, if at all, &amp; the same for encryption. You do need Ocster Backup to restore any files, which probably isn't that big a deal for most home users -- you wouldn't use it for really long term archives <em>[I hope they're still around, but 5 - 10 years from now?... ]</em> &amp; it's not intended to replace the full disk/partition image backups you should be doing anyway <em>[which presumably would include your Ocster Pro install]</em>. And for extra insurance there's always the trial -- it might not hurt to download &amp; save a copy as part of your whole backup in case of disaster plan. As file backup apps go Ocster does a good job, &amp; it's very easy to set up plans including the usual My Documents, My Pictures etc. folders -- you might want to set up more than one plan because Ocster won't backup when it detects changes, nor will one plan run more than once a day <em>[unless you tell it to manually]</em>... that's not a huge negative though, since while you may decide to back up your e-mails hourly for example, whatever you have in other folders may only need backed up once a day (or less), &amp; backup archives do take up space. Again because it doesn't replace a disk/partition image backup, there's no need to include things like software or Windows files, nor is there a need to have a boot disc or any of that -- it just makes it as fast &amp; easy as possible to get individual files/folders restored. Ocster Backup Pro does make an impact on your system during installation, which may include C/C++ runtime installs from Microsoft, along with Windows updates for or to those runtimes. Installing Ocster Backup also mirrors your User files/folders, which can mean an awful lot of new files &amp; folders taking up a fair amount of disk space. Additionally you've got 2 folders added under All Users, + 1 more under your <em>UserName</em>, a Microsoft folder under Common Files, &amp; the program's folder itself [~20 MB in 190 files, 2 folders]. Registry adds can go north of 3k. IMHO the choice of how to backup new &amp;/or changing files depends on how valuable those files are to you, what security's needed, what hardware &amp;/or devices you use, &amp; how much time &amp; effort you want to put into it all. If most all your docs, images, e-mails, &amp; tunes for example are stored on-line <em>[i.e. in the much-hyped cloud]</em>, you might have zero need. Likewise you may keep everything synced on-line for access with your cell, so the copy on your hard drive is just that, a copy. OTOH some e-mail &amp;/or docs may be too sensitive to let go of -- that's where something like Ocster backup, or data/drive mirroring come in. The Proprietary thing is a a deal breaker for me....here is why, let's say disaster does strike, you are counting on being able to restore your data by installing the 30 day trial. Well, what if the company goes out of business by then or they have changed their proprietary format and it can no longer read the old one. (I have seen both happen), no backup software must use standard formats, either simple copies or .zip files, etc. I think I will pass on this myself. But if the proprietary aspect is the only thing holding you back, consider this. If you use this program and disaster strikes and you need to get your data. You can download a 30 day trial of the program. It is fully functional and will allow you to restore your data if you do so within 30 days. So the proprietary issue does not have to be a deal breaker. As always thank you to the GAOTD team for your efforts and thank you to the publisher, Ocster, for the gift. 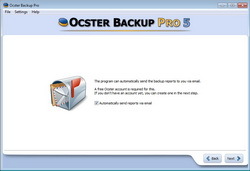 "Ocster Backup Pro 5 is the successor to the highly regarded Ocster Backup Pro 4." You have a chance to grab my attention and the best thing you can say is, 5 succeeds 4? 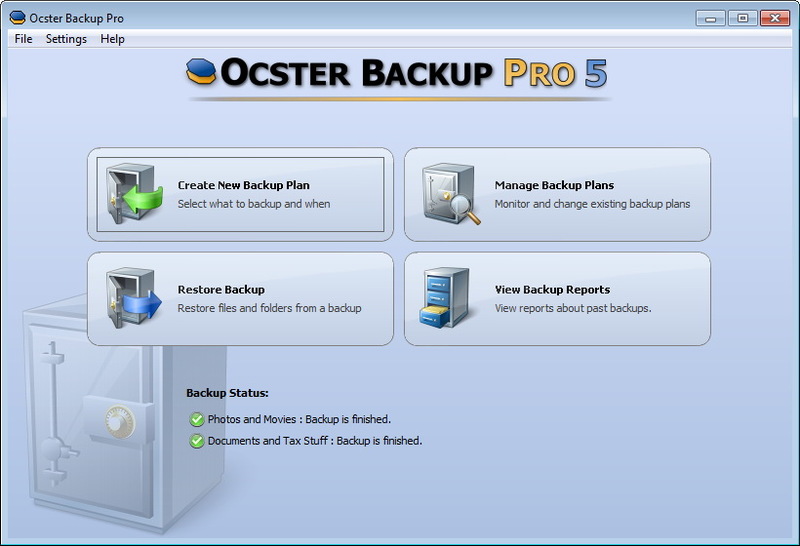 This company immediately made me chuckle with the very first sentence: "Ocster Backup Pro 5 is the successor to the highly regarded Ocster Backup Pro 4." You have a chance to grab my attention and the best thing you can say is, 5 succeeds 4? What sense does it make to backup your machine with proprietary software that you'll have to purchase when you want to restore your machine due to a crash? Someone advised installing the software on two machines. How would you restore computer A by running the restore software on computer B? What sense does it make to backup your machine with proprietary software that you'll have to purchase when you want to restore your machine due to a crash? Someone advised installing the software on two machines. How would you restore computer A by running the restore software on computer B? What I'd like to see is a backup programme that will save the files and directories I want (some of which are in DOS -- showing my age!) in "native format" -- ie. with NO compression or encryption, so I can just get back the single file I want, if that ever eventuates. I'd hate to have to go searching to get back one file, and moreover, I might want to run, say, my JPG viewer programme on the backup version sometimes, to check it, for instance. Maybe I'm just old fashioned though.... Anyway, in this case, thanks, but no thanks. I'll look into some of the other, free, alternatives. If they don't do what I want, I guess I can use the old fall-back, XCOPY, in DOS, and make suitable batch files to copy whatever I particularly need to repeatedly back up. I, too, can't imagine why anyone would want to use a programme that backs up to a proprietary format. I would hate to be at the mercy of some software manufacturer -- ie. HAVING to buy their programme because something went wrong.... What I'd like to see is a backup programme that will save the files and directories I want (some of which are in DOS -- showing my age!) in "native format" -- ie. with NO compression or encryption, so I can just get back the single file I want, if that ever eventuates. I'd hate to have to go searching to get back one file, and moreover, I might want to run, say, my JPG viewer programme on the backup version sometimes, to check it, for instance. Maybe I'm just old fashioned though.... Anyway, in this case, thanks, but no thanks. I'll look into some of the other, free, alternatives. If they don't do what I want, I guess I can use the old fall-back, XCOPY, in DOS, and make suitable batch files to copy whatever I particularly need to repeatedly back up. In case anyone has trouble getting the program to bring it up, the registration page is at https://www.ocster.com/go/fullreg?pid=obp5&ver=5.05&edt=gaotd10d&loc=en-gb&rel=final&sloc=en-us&os=windows&osver=5.1.2&bit=32&cur=USD. * Uses a proprietary format for the backed up data. That's all I need to know to skip this. There are numerous backup programs available that create standard zip archives. <cite>In comment #1 it was said:</cite> <blockquote>The Bad * Uses a proprietary format for the backed up data.</blockquote> That's all I need to know to skip this. There are numerous backup programs available that create standard zip archives. Ashraf, you became a feature of this site and when you don't show up, people scramble in all directions asking what to do. Experts like Mike, Funken, Bubby, Giovanni and you are crucial for the mere mortals like me. Happy to see you back and hope you'll stay for long. Thanks #1 & #2 Tony for pointing to Gizmo's site. Haven't checked in there for awhile. User comments at bottom of his reviews of best backup prgs is helpful. Like discussion of diff between Comodo Backup and the Time Machine (restore only). Gotta be cautious with these. Pass on today's offer to stay with the old reliables. Thanks #1 &amp; #2 Tony for pointing to Gizmo's site. Haven't checked in there for awhile. User comments at bottom of his reviews of best backup prgs is helpful. Like discussion of diff between Comodo Backup and the Time Machine (restore only). Gotta be cautious with these. Pass on today's offer to stay with the old reliables. Good A.M. from the East Coast; hey, as simple as it sounds, has not anyone simply considered downloading and installing the software on a remote device; (Flash Drive) for instance? It is easy as that! Alot of your inquiries and questions are settled. This is how I download and install all my software. Whatever I choose not to keep on the hard drive I delete; the rest I save on a portable device or an online server for backup. Never fails! Works like a charm! You always keep your registration code with all your pertinent info on a remote device, or a third party server....................Have a great day! Fully agree with #9 , keep up the good work ash . Will have a look at the free alternative mentioned before commitment to this . A few people were wondering if the feature that restarts the back up after crash or reboot works..it does. So now you say " well if my system crashes I wont have todays giveaway any more, so how will install my back ups?" easy..set up a account with Ocster,they keep your key on file,so if you have to reinstall there should be no problem.I have uninstalled(by accident),or had a system crash and all I had to do was redownload, sign in to my online account and retrieve my key, no problem. This is a good back up program in my opinion. I haven't tried this version but have used v4 and I am now using the business version for daily back ups. A few people were wondering if the feature that restarts the back up after crash or reboot works..it does. So now you say " well if my system crashes I wont have todays giveaway any more, so how will install my back ups?" easy..set up a account with Ocster,they keep your key on file,so if you have to reinstall there should be no problem.I have uninstalled(by accident),or had a system crash and all I had to do was redownload, sign in to my online account and retrieve my key, no problem. This is a good back up program in my opinion. I haven't tried this version but have used v4 and I am now using the business version for daily back ups. Besides using a proprietary format, it will only backup to the same computer on which it is installed, an external hard drive, or network. It will not backup to flash drive or DVD/CD disk. Just installed on Windows 7 64 Bit. What I thought was a good feature was that if it is running a backup and you reboot your machine or your computer crashes, then it is supposed to continue backing from the correct point when rebooted. Haven't tested that yet but sounds like a really good feature. I could do that manually in less than 5 minutes by simply transferring the files to a folder on an external hard drive. My computer is rocket fast so I don't know why it would be so slow. #1's review says everything else anyone would need to know except my super-slow experience. I will be canceling the back-up so I can shut my computer down. I'll give it another try tomorrow. This appears to be a handy tool but it's very slow. My back-up plan was only 6GBs and after one hour I still have an estimated 31 hours left as seen here: http://lulzimg.com/i9/1d57ff49.jpg I could do that manually in less than 5 minutes by simply transferring the files to a folder on an external hard drive. My computer is rocket fast so I don't know why it would be so slow. #1's review says everything else anyone would need to know except my super-slow experience. I will be canceling the back-up so I can shut my computer down. I'll give it another try tomorrow. Does Ocster Backup Pro has an ability to back up data through the use of a Volume Shadow Service of Windows? I’m currently using Handy Backup (http://www.handybackup.net) and I’m completely happy about it, except one thing that I have to close Outlook, in order to have it backed up. If I select Outlook’s OST/PST files in Genie, and schedule the backup job, will I be able to continue working with it, without closing it when the time for backup comes? Does Ocster Backup Pro has an ability to back up data through the use of a Volume Shadow Service of Windows? I’m currently using Handy Backup (http://www.handybackup.net) and I’m completely happy about it, except one thing that I have to close Outlook, in order to have it backed up. If I select Outlook’s OST/PST files in Genie, and schedule the backup job, will I be able to continue working with it, without closing it when the time for backup comes? 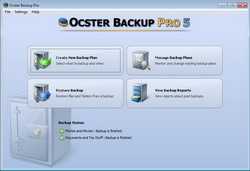 i m using ocster backup business, how it is different from that? * Nice, aesthetically pleasing interface. * Allows users to backup individual files or whole folders. 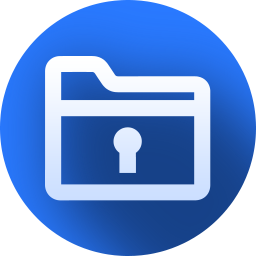 * Includes handy "shortcuts" for easy backup of common folders and file extensions. * Has the ability to easily backup Microsoft Outlook (2003 and higher) emails and calendars. * Includes an "exclusion" filter which users can use to exclude specific files, folders, or file extensions from being backed up. * Has an "automatic pausing" feature that automatically pauses/resumes backups based on current computer usage (i.e. if you are doing something on your computer that is resource intensive, the backup will be automatically paused and will be automatically resumed when computer resources are freed up). * Allows users to restore files/folders selectively. * Allows users to restore different "versions" of backed up files. * Has multiple methods of compressing and encrypting backups. * Allows users to schedule backups to automatically occur. * Gives users the ability to keep extensive reports and automatically e-mail the reports. * Lacks choice of different backup methods/types. * Aside from Microsoft Outlook, lacks the ability to easily backup third party software related data. * Automatic backups can only be scheduled for a daily or weekly basis. 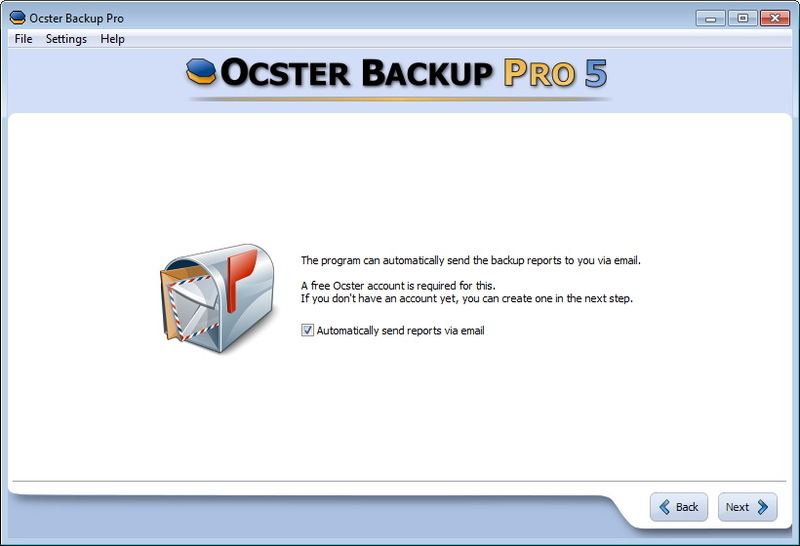 * Sending out backup report e-mails requires users to register (for free) with Ocster - no ability to use own e-mail address. * "Versioning" feature does not work if backing up files on the same day.